World record holders Paul and Josh Lunn. Media attention was on the pair at Reading after the local press had previewed their record-breaking bid, and the talented twosome did not disappoint. Josh Lunn (right) in action. A high-class field had been assembled and Lunn the Younger found himself sharing early wind-shielding duties with a good sized pack, which included former Nene Valley star Chris Wright and New Zealand ace Paul Martelletti, as he set off pace that he hoped would see him finish in around 67 minutes. Perhaps spurred on by speculation that as the oldest of four brothers he could be off the teat a am if the record bid failed, the 27 year-old enjoyed a magnificent run finishing 12th and surpassing his own expectations while setting a new lifetime best of 1:06.29. The previous world record was 2:24.47 which left Lunn the Elder with time to play with. 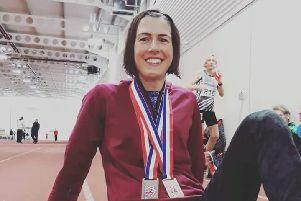 The triathlete had prepared for the race in traditional distance runners style with a bottle of wine and a pizza the night before in his travelodge room . However, he knew the course well, having run his fastest half-marathon of 75:00 in Reading four years ago and was brimming with confidence. The 46 year-old senior member of the double act failed to disappoint, shattering his own fastest time, crossing the line in 1:14.04. With a combined time of 2:20.33 the pair re-wrote the record books, knocking over four minutes off the previous mark. 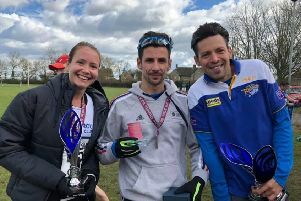 “It was great to take another chunk off my PB from Peterborough last year and to be racing with my old Nene Valley clubmate Chris Wright” said junior partner Josh. Helpston team-mate Jim Morris is not one to be overshadowed and came away with a cash prize after running 1:20.02 to finish as first Over 50. Morris’s wife Louise was even happier as the family tradition is that her husband keeps the trophies while she gets any prize money! Wright, now London based, had a day to remember, running a new PB of 1:06.10. He ran most of the race with Josh Lunn finishing one place ahead of him in 11th spot. The pair are both now in the top 25 of the UK rankings.